'I'm interested in cognitive landscape, the terrain that one sees, somewhere behind the eyes' - Paul Morrison. 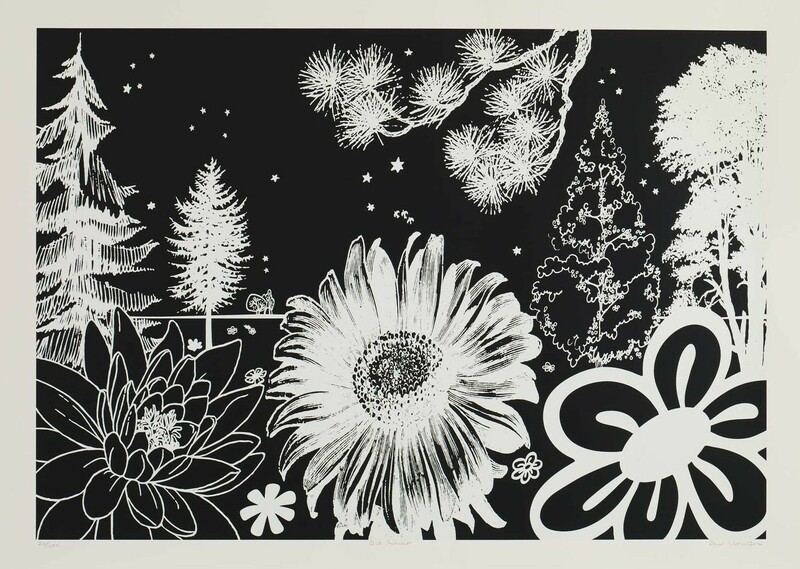 Manifold Editions publishers three new editions from the Sheffield artist Paul Morrison, whose enigmatic botanical landscapes and night gardens combine familiar and unfamiliar elements of plant forms and flowers with motifs ranging from renaissance art to Lichtenstein and 60s Op Art. His intensely linear work typically disrupts proportions so that tiny plants become huge and massive trees shrink, creating an unsettling experience that leads the viewer to a 'cognitive landscape' lying beyond the image plane. Screenprint: Black plus protection varnish & white screenprinted a number of times, finished with a satin glaze on the white. Printed on 410 gsm Somerset Tub Sized. Published by Manifold Editions 2013. Paul Morrison (born 1966, Liverpool) graduated in Fine Art from Goldsmiths College in 1998 and now lives and works in Sheffield and London. Morrison’s landscape paintings, wall murals, films and prints sample imagery from a wide array of sources ranging from newspapers, cartoons and antique volumes of botanical illustration to sixteenth-century woodcuts. Since his first solo exhibition in London in 1996, Morrison has exhibited internationally. Group exhibitions include ‘Repicturing the Past/Picturing the Present’, Museum of Modern Art, New York (2007); ‘Murals’, Fundació Joan Miró, Barcelona (2010); ‘Nothing is Forever’, South London Gallery, London (2010) and ‘Gold’, Belvedere, Vienna (2012). Paul Morrison’s work can be found in collections worldwide, including the British Council Collection; the Government Art Collection; the Museum of Modern Art, New York, and the Victoria & Albert Museum, London.